October of 2015 I attended the Advanced Imaging Conference in San Jose, Ca. I attended workshops by Adam Block, Thierry Legault and Chris Go. The photo at the left is Thierry Legault (left), Chris Go (center) and me (right). The talks and workshops were excellent. There were numerous vendors setup in a separate area that was open to the public on Saturday. I met Dr. Dennis Conti who was putting together a group to monitor exoplanets in support of a Hubble observing project. I also met Ken Hose who helped me when I first attempted exoplanet light curve imaging and analysis. Click on the image to see a slide show of photos that I took at the conference. Christmas 2013 Joan and I spent a few days in Sedona, Az. On Christmas eve, while Joan was exploring shopping in Sedona, I drove to Flagstaff to visit Lowell Observatory. The drive up Oak Creek Canyon was spectacular scenery. When I got to the top of the canyon at 7000 ft. there was lots of snow on the ground from an earlier snow. The roads were clear. 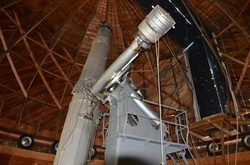 When I arrived at Lowell observatory I watched a video about Percival Lowell and Clyde Tombaugh and then took a guided tour of the 24" Alvin Clark Telescope. Click the image to see a slide show of photos from my visit. In November of 2008 I visited McDonald Observatory. 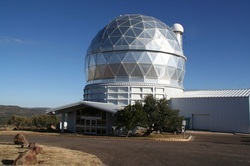 The Observatory has a program where the public can come for "Dinner and Viewing". When I visited the program used the 82" telescope. Reservations must be made in advance. In addition, the visitor can make reservations and stay at the Astronomer's Lodge. I enjoyed the visit and observing session through the 82" telescope. Here is a slide show of a few photos that I took on this trip. The drive from Dallas was long, but worth it. I was fortunate to attend Adam Block's image processing workshop on Mt. Lemmon at the end of May 2009. 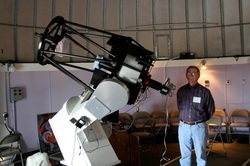 The workshop began with a tour of the Steward Observatory Mirror Lab at the University of Arizona. We then caravanned to the top of Mt. Lemmon where we were exposed to a fire hose of information from Adam with brief interruptions for food and sleep. Click on the image to the left or here to see a few of the photos that I took during the weekend. Some of the photos were taken by Jerry Wilson who was kind enough to share them with me. I would refer anyone with questions about the workshop content to Adam Block's web site. I thoroughly enjoyed the workshop. I highly recommend it to anyone who wants to improve their image processing skills and experience a world class observing location.